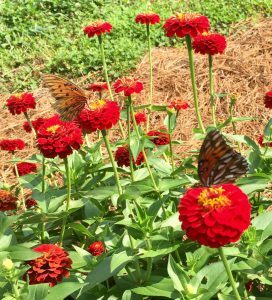 Located in Rome, GA, the Major Ridge Demonstration Garden at the Chieftains Museum is served by Floyd County Master Gardener Extension Volunteers (MGEVs). The project demonstrates environmentally friendly landscape practices within a historically accurate demonstration garden that is open for children and adults to visit. In an effort to educate the public about Native American and southern agriculture, the Chieftains Museum Advisory Board requested assistance from the UGA Floyd County Extension agent and MGEVs. The Board’s objective was to create a demonstration garden providing an educational setting for school groups and adults to learn about the workings of this historic home, along with Native American and southern agricultural practices. 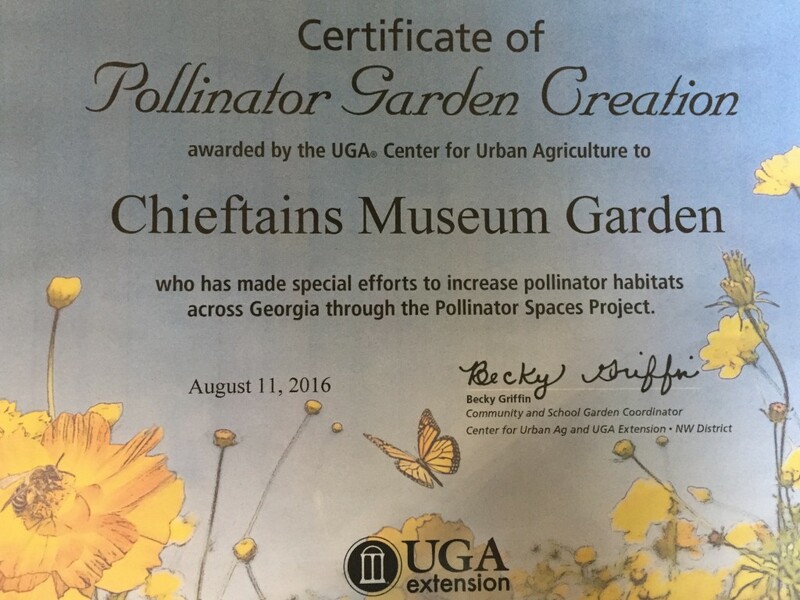 In 2015, the UGA Floyd County Extension agent and MGEVs partnered with the Chieftains Museum Advisory Board to create a team of community supporters, the Chieftains Museum Landscape Advisory Committee. MGEVs were joined by representatives from Berry College, Georgia Northwestern Technical College, and the Junior Service League. Their mission was to research, design, and implement a demonstration garden. The museum relied on Floyd County Extension and MGEVs to provide valuable gardening insight, create a landscape design, and implement the plan developed by the Chieftains Museum Landscape Advisory Board. To further educational opportunities and outreach to the community, MGEVs conducted school field trip tours for local and regional K-12 schools. In 2016, 461 K-12 students toured the garden as part of the Museum’s field trip program. Students learned about the history of Cherokee agriculture along with the crops the Cherokee grew. In addition, students from the horticulture program at Georgia Northwestern Technical College participated in several on-the-job work experiences at the garden. This demonstration garden has allowed the museum to establish a network of partnerships with other organizations. 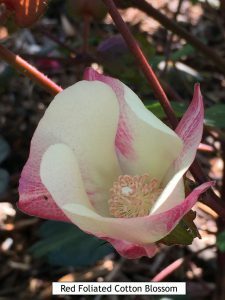 The Museum and the Landscape Advisory Committee are currently in a partnership with the Agrobiodiversity Program at Berry College, focusing on seed saving. Through this partnership, the Museum hosted a seed swap for gardeners around the area. People came from as far away as South Carolina to attend the event. During this event, MGEVs were on hand to offer advice about home gardens and planting tips. In addition, visitors to the museum enjoyed the garden, particularly the cotton plants, which before visiting they may never have seen up close. Visitors this past summer have come from as far away as Australia to tour the museum and the garden. Through a grant from Berry College, the Museum has added an arbor in the garden that was designed and built by an MGEV. Museum-quality reader boards have been installed in the garden and on the property. The grant also provided for lectures from two Cherokee Studies scholars to speak about early Cherokee agricultural practices. Collaboration with area colleges, schools, and organizations continues, thus improving the garden. The garden extended the Museum’s ability to educate the public about Cherokee history and its impact on agriculture. Looking ahead, garden plans include adding memorial benches, a centerpiece statue, and additional in-ground beds. Plans also include adding a grape arbor, since records indicate Major Ridge grew muscadines and scuppernongs, while also making wine. The Major Ridge Demonstration Garden was recognized by two state programs in Georgia. 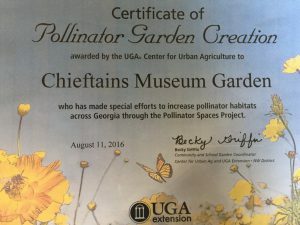 The University of Georgia Center for Urban Agriculture recognized the creation of a pollinator garden as part of the Pollinator Spaces Project sponsored by UGA Extension, Northwest District. The garden was also honored by becoming the newest stop on the Rosalyn Carter Butterfly Trail. Floyd MGEVs are thankful for the amount of visibility for the Master Gardener Extension Volunteer Program this project has generated. 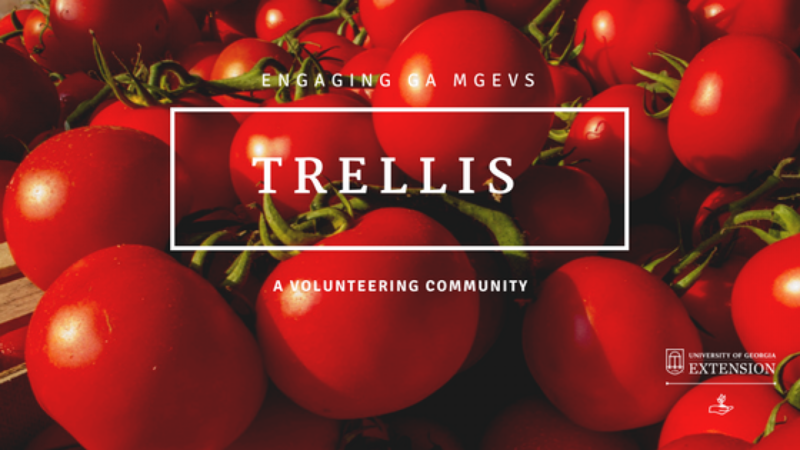 Through the school groups, workshops, and lectures open to the public, many more people have become aware of what MGEVs do, and, more importantly, know. Interacting face-to-face with the community, MGEVs have a forum to spread the word about environmentally sound horticultural practices. *This Floyd County project was featured as a 2016 Project Spotlight. To learn more about the project spotlight process and other MGEV projects around the state, go here and here. Posted in Funding, Projects, Volunteering. This entry was tagged Cherokee, history, tours. Bookmark the permalink.